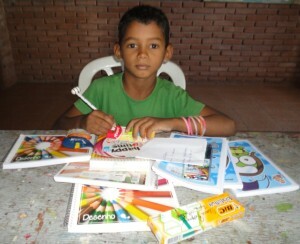 Cicero, now aged 9, tells us his sponsor has a special place in his heart. She has been a consistent and caring presence in his life since 2009 and in that time an invaluable relationship has grown, one that has helped him through some hard and lonely times. Cicero’s family comes from a rural farming community where work is often scarce during the dry season. In 2010, his father had to find work away from home and over the following year his parents’ marriage broke up. Both of them went to live with new partners, leaving Cicero and his two sisters in the care of their grandparents. Understandably, Cicero felt hurt and abandoned. His schoolwork suffered and, at times, he could be aggressive with other children. But, he says, his sponsor’s letters were a huge support. Just knowing there was someone who cared about him was a genuine source of comfort when he felt most alone. It’s easy to sponsor a child with ChildFund Ireland. We can connect you with a child in a community in any of the 12 countries we work in. We’ll match you with a child you feel you can relate to and help you to keep in touch, so that you can see the incredible difference your sponsorship makes, each and every day. Do something incredible: Sponsor a Child today.